I was a teensy bit late to the Pinterest game, I'm not going to lie, But once I got here about a month and a half ago, I found it really damn hard to find any blogger advice on how to use Pinterest. After a shaky first week or so I eventually found some interesting pieces of advice, ironically, on Pinterest, about how to use it, and how to optimise my use of it for the blog. So, I've gathered my top tips for those of you who have never used Pinterest, or still don't *really* know how to get to grips with it. In the first few weeks I did consider giving up on it - it seemed like wayyyy too much effort to keep up with whilst I had no clue what was going on. But now that I know more, I've totally fallen in love with it and I'm pretty much 100% obsessed. I've learnt masses about blogging, found new countries and cities to fall in love with, and created tonnes of recipes from it! The first thing you need to do is (obviously) set up an account. You need to choose a name, and, like choosing one on any kind of social media, this is pretty important. I've gone with Stephanie | Nourish ME as I wanted it to represent my blog and include a little bit of my own self too. I would definitely recommend considering using your blog name somewhere in your Pinterest name as it ensures that you carry your brand across to that social media platform. Alongside a name, you'll also need a short bio. This should contain some of your interests so that people will know what kind of things they can expect to see you pinning as well as a little bit of information about your blog. Mine looks like this: "UK based health, lifestyle, fashion and beauty blogger. All round foodie and lover of developing new recipes". I'm still tweaking it, but this basically summarises most of my blog post topics and my main hobby (FOOD haha). A final part of your setup is to connect your Pinterest with your blog domain or blog address. You simply add this in, and once you've verified that it's yours, it will appear as a link on your Pinterest. This way you can drive traffic straight from your Pinterest account to your blog every time someone finds your account. At first Pinterest will do the standard social media thing of getting you to pick areas of interest (yayyyy, can we not just skip this already). So once you've sorted out your five or so things that you would like to hear about, you can get down to the real nitty gritty of finding what you want to see on Pinterest. I did a little call out on Twitter to discover some blogger friends who were on here to start, but my main sourcing of followers came from finding Dork Face Blog's Pinterest. I absolutely LOVE Jemma's style and enthusiasm for all things colourful and pretty, so I decided to follow a fair few people she followed - if they were good enough for her then I was sure to fall in love with their pins, right?! After following a few of those lovely bloggers, I then basically searched key terms like 'baking', 'lifestyle', 'blogger', lifestyle blogger', 'food', 'recipes', 'travel blogger' and so on. For the first few weeks I followed 20 people a day and this seems to have really helped in terms of securing a decent following so far! Okay, this one had me really stumped at the beginning. I was mindlessly staring at the screen with 'what is a pin?' and 'how do I even pin things?' and 'good lord, what is this dashboard thing and how do I control it?!'. 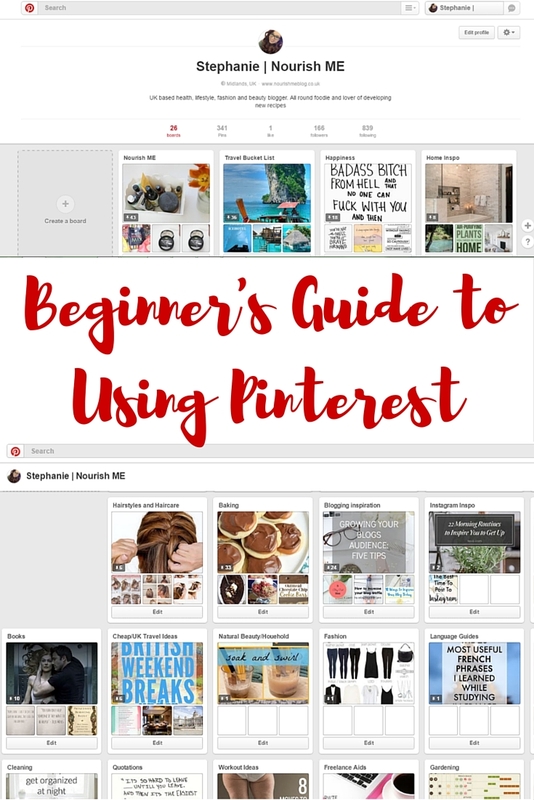 Basically, if you've ever used Tumblr (hello my 17-year-old obsession), then getting to grips with Pinterest is going to be a LOT easier for you! Basically your dashboard is where everything that people you follow have pinned or repinned will appear. You can click on any picture on your dashboard and it will enlarge. If you click again you will be taken to the website that the post originally appeared on (hopefully - occasionally you get taken to a different page than what the image suggests, argh). Once you click back onto Pinterest you then have the option to either 'x' out of the enlarged image, or pin it to one of your boards. So, you've decided to pin something and now you're faced with 'choosing a board', say whaaaat?! This had me a teensy bit baffled, to say the least, at first. A board is basically a category to put your pins into. Mine range from baking, to yoga, to blogging inspiration, to cocktail recipes, with about 20 more in between. Having a whole range of Pinterest boards makes it easy for me to find an article or recipe quickly without having to trawl through hundreds of irrelevant pins. When you save a pin you get to choose to put it in an already existing board, or create a new one. This is one of my favourite aspects of Pinterest, as it makes creating new boards really easy and convenient. The way you organise your boards is also pretty important. Pinterest simply places them in the order in which you created them, but it's really easy to move them around. To get the greatest number of hits on your blog, it's best to have it in your top row as you can see that I've done in the pictures above. In that row should also be the boards you're most proud of, and ones that you think will draw people to your Pinterest. I've got my Happiness, Travel Bucket List and Home Inspo boards up there alongside the Nourish ME one. So, once you've got everything set up you really need to make sure that you can actually use your blog posts on Pinterest, and that other people can too. The first thing you really need to do is install a hover pin button to put over your photos. That way people can simply click and add the post via the photo to their board. Then, you need to create an 'alt tag' for each picture that sums up the post. On blogger you do this by clicking on your image, then clicking on 'properties' and adding text in to both boxes. For example, my ones for this post are 'Beginner's Guide to using Pinterest for bloggers - by Nourish ME www.nourishmeblog.co.uk'. This is the summary people will see underneath your image on Pinterest. Finally, when you publish a post pin it yourself so that hopefully people will see it and repin! I know that was a massively long post, so kudos to you if you're still here! If you've got any more questions, comment below or tweet me @stephhartley4. I swear I was a complete lost puppy when I first started Pinterest. I didn't have the brains to go searching for a Pinterest guide like this and I think things would've changed if I actually did, haha. Lovely guide, Steph! I find it really useful! You don't have to trawl through loads of pins to get to what you want! You're welcome. Yes, longer pictures are better! Thanks for these tips Stephanie! I think Pinterest is such a handy tool for bloggers and a great way for people to discover your blog.